Because stores (and bars) may not be open on Christmas Day—when you need a drink most. Overcomplicated drinks have a habit of coming out during the holidays, dressed up with candy-cane stirrers and marshmallow garnishes. There’s never a great time to encounter bad cocktails, but it can be especially alarming when liquor stores are closed. How to cope? Many respectable drinks can be made with just two ingredients. We’ll assume you know the classics already: the martini, the screwdriver, the bellini and any pair of common mixer with common spirit: rum and cola, gin and tonic, whiskey and ginger. Here are 11 more excellent combinations to try. Look for a beer that has hoppy, piney notes (like many IPAs) and a light, herbal absinthe (consider Vieux Carré Absinthe Superiéure). Combine one part absinthe with two parts beer. This also works with root beer, thanks to the licoricey flavors that it shares with absinthe. Best on ice. Known as the Kalimotxo, this Spanish cocktail was probably first invented to mask bad wine. Mix the ingredients at 50/50 ratio. Feel free to experiment with different reds, and use the cheapest bottle of wine you actually like. Sweetly floral St-Germain elderflower liqueur elevates this drink above other sparkler-based combos. Mix one part St-Germain with four parts sparkling wine. But first, brush up on your elderflower trivia in case anyone asks what you’re drinking. This is best with sweetened tea (and there’s no shame in using Snapple). 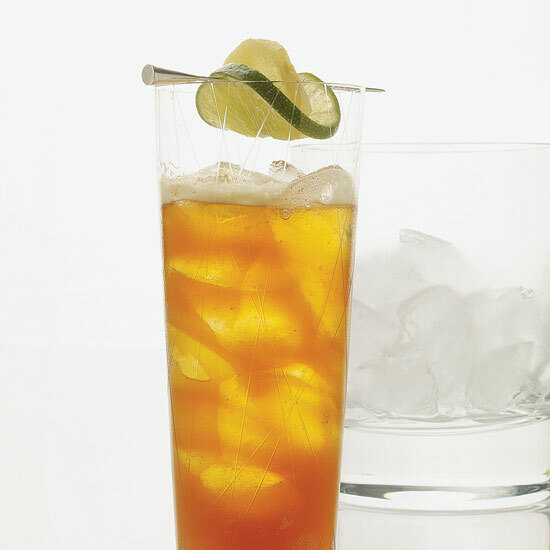 Add one part bourbon to two parts iced tea. A lemon garnish would add a nice zap of fresh citrus and make it look fancier. You may know this as a Black Russian (no cream) or a White Russian (with cream), but for the record, neither is actually from Russia. In all cases, mix two parts vodka with one part coffee booze. If it’s before noon, serve in a coffee mug. These two components are all you need for a Dark ‘n’ Stormy. Cocktail nerds argue about whether you must use Gosling’s Black Seal Rum (one part rum to two parts ginger beer) to properly make this drink. Regardless, the cocktail is always served on ice. Some folks add lime juice, but it’s not mandatory. This counts as two ingredients if we assume you take your coffee with sugar and cream. One part whiskey to two parts coffee is a good ratio. If there’s some whipped cream hanging around (or even a can of Reddi-wip), put it to use as a garnish. If screwdrivers seem too pedestrian, or you want something that feels like an aperitif, just swap the vodka with bitter Campari. Suddenly, the drink has European flair. Use a little more juice than Campari and pour over a healthy mound of ice. The smoky flavor of any mezcal will balance the sweet and tart notes in apple juice—and it’s likely to please the Scotch drinkers in the house, as well. Mix in equal proportions, one to one. OK, this is cheating a little because the vodka has vanilla in it, but you’d be hard-pressed to come up with a more festive holiday drink. Combine in a glass with one part schnapps to two parts vodka. For dessert, try this delightful stout milkshake. Add both ingredients to a blender with ice and play with consistency by adjusting the amount of ice cream.